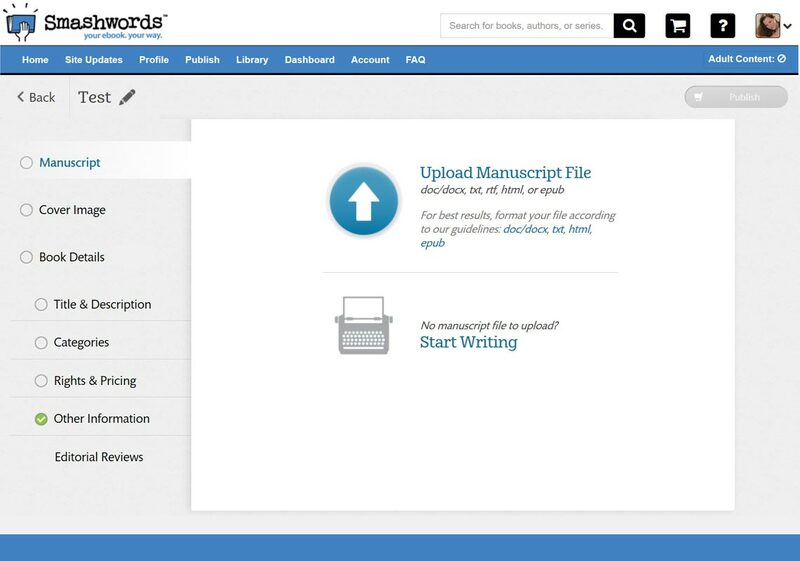 Smashwords is an online retailer and distributor of indie ebooks. 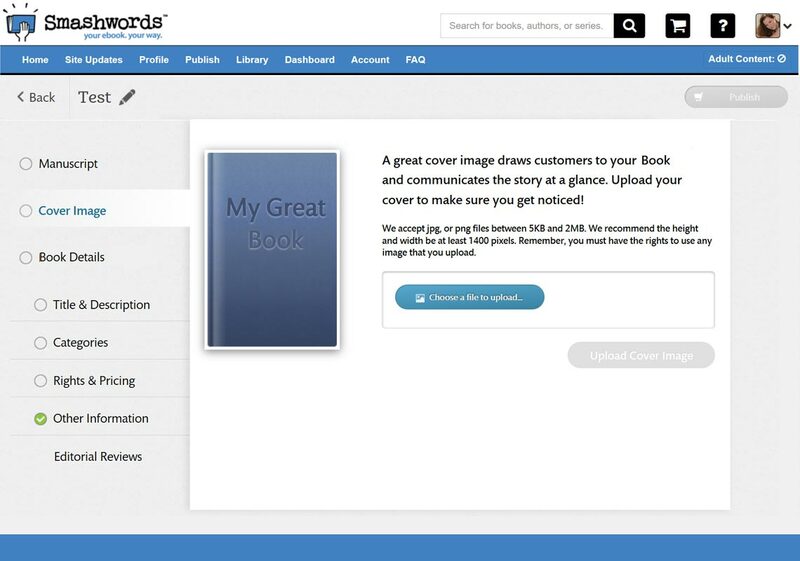 It offers a fast, free and easy way for independent authors to publish and distribute their ebooks to major retailers. Their soul revenue is from earning a percentage of book sales published through them. However, only half the customer who register as an author actually publish a book. They like to increase that number. 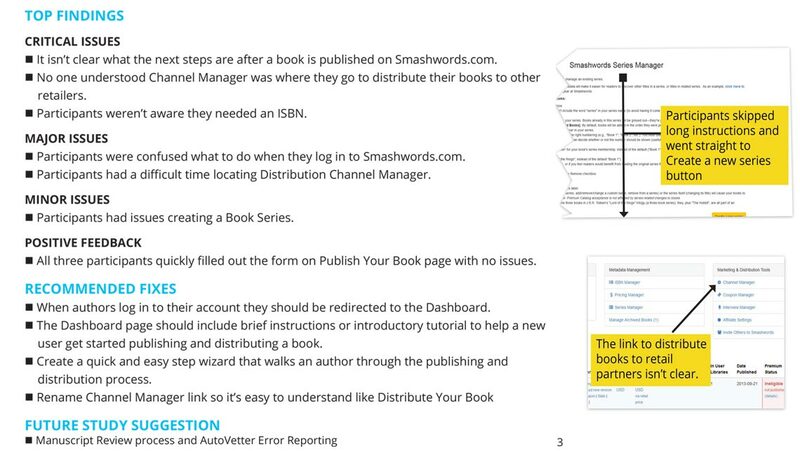 I recommend Smashwords overhaul their author portal and publishing process so it is more streamline and easier to use. 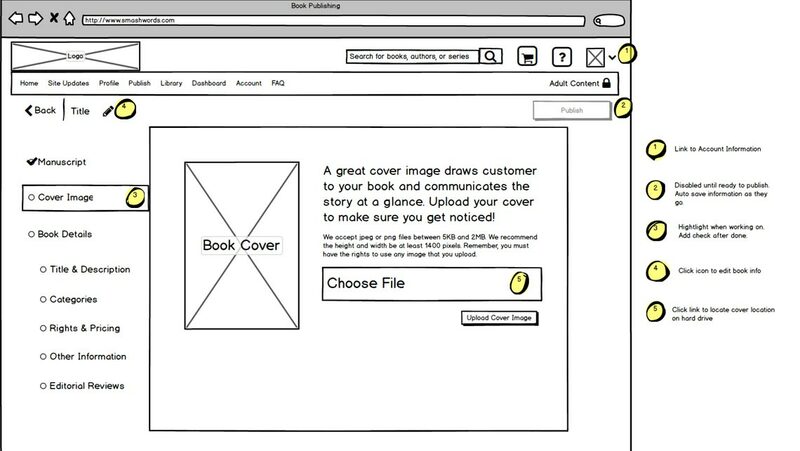 Each book publishing step should be self-explanatory to elevate the need of several pages of instructions and tutorials. 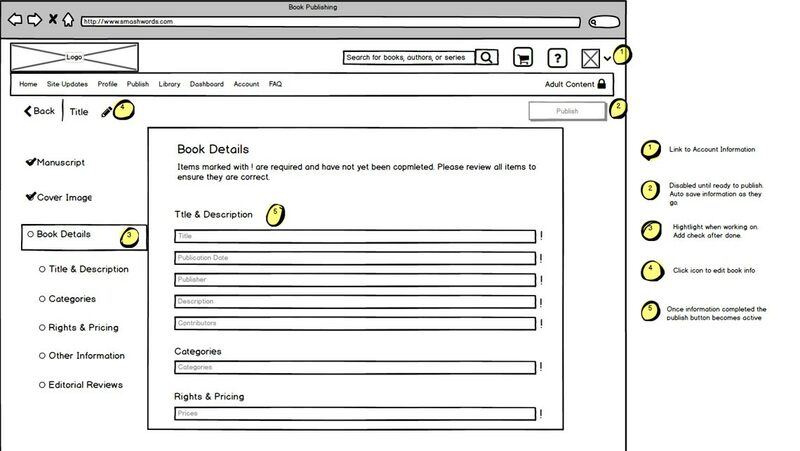 Furthermore, they should offer a step-wizard for new users and an easy one-page form for pre-existing users. I performed a heuristic evaluation and interviewed existing customers. I was able to narrow down the issues and test customers to pin point exactly the trouble spots. 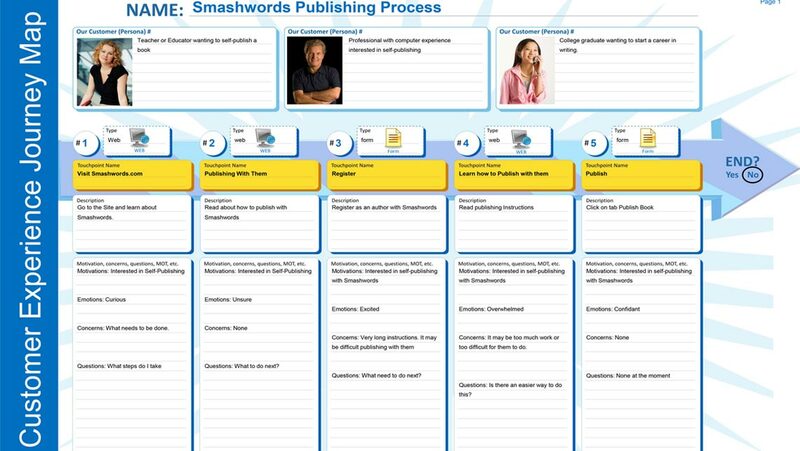 I was able to create a customer experience journey map to get a better understanding where and why users were abandoning the publishing process. 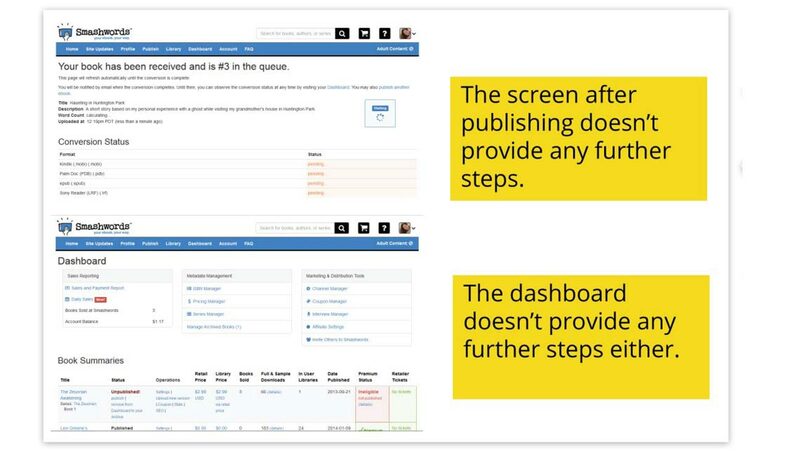 The layout and messaging in the author portal is only small part of the problem. 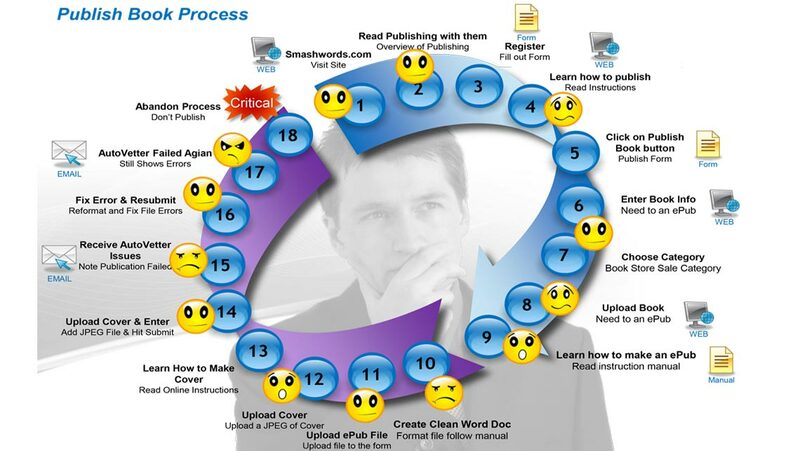 Most of the problems is from the cumbersome and confusing publishing process. 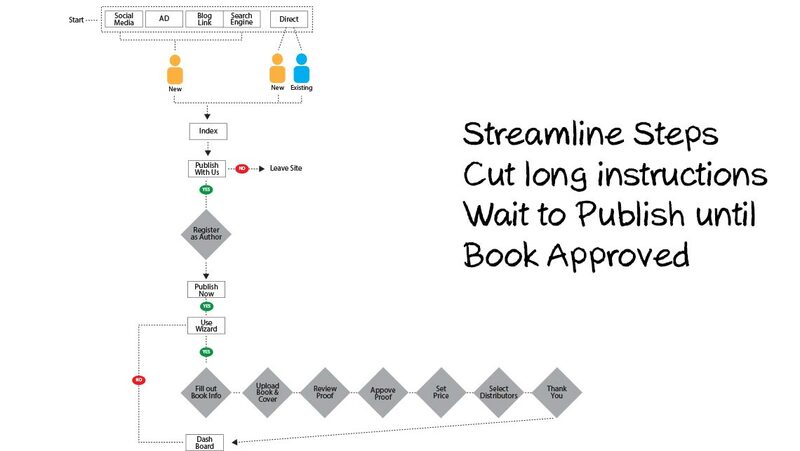 I defined customer persona's and created user journeys for each. 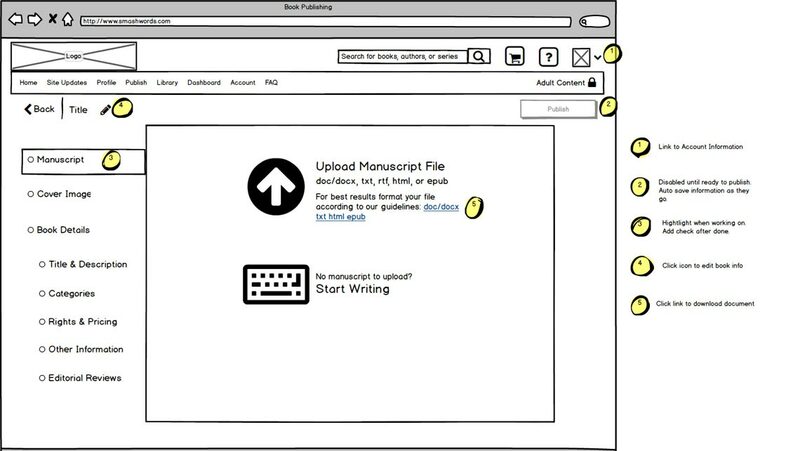 From there I was able to design a new task flow, which would maximize usage of the publishing tools. 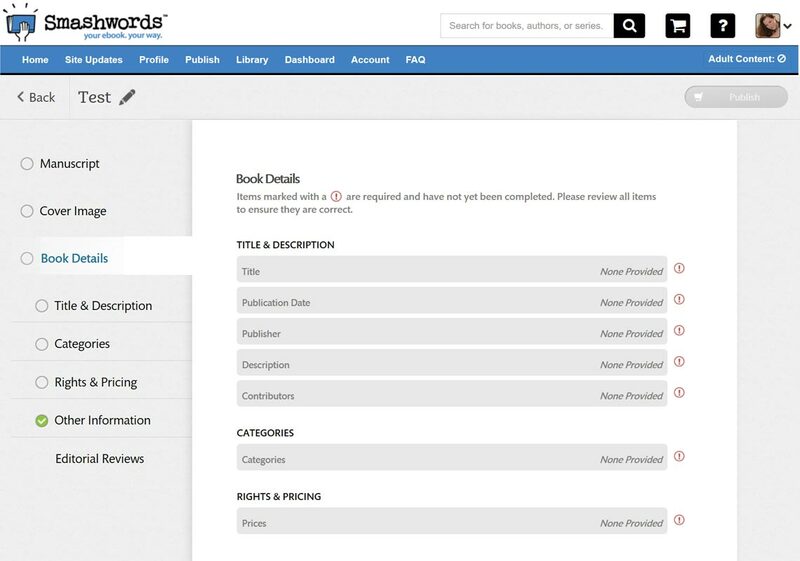 I created wireframes of the author portal and publishing tools. 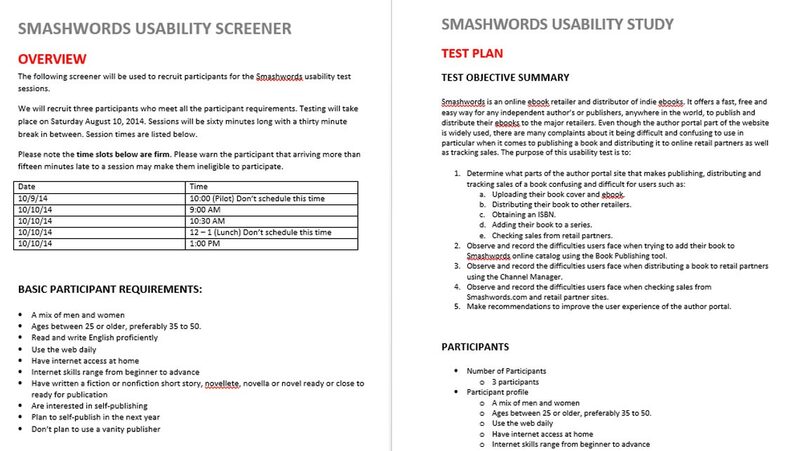 Then I converted them to high-fidelity clickable prototypes for user testing. I conducted a usability study of existing users. The goal of the study was to test the prototype and determine if the new prototype was easier to use. 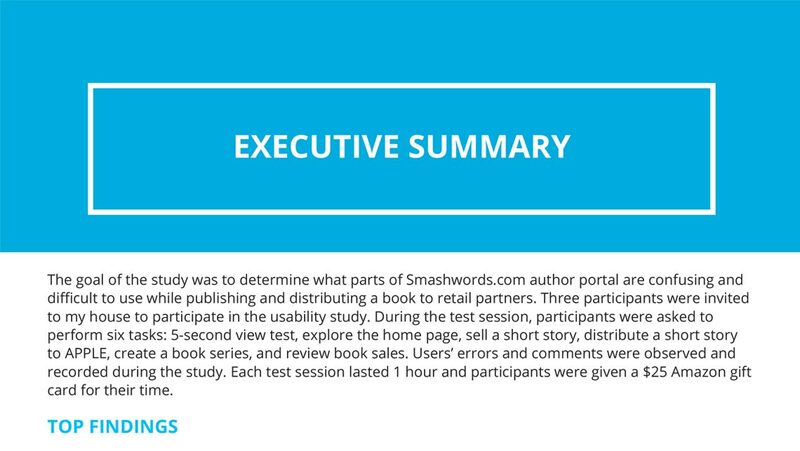 85% of the usability study participants were able to register a book in less than 6 minutes. 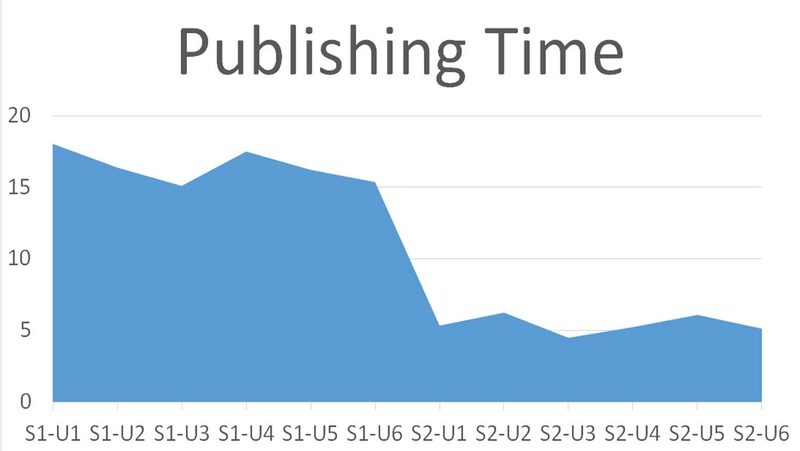 79% of the usability study participants continued to publish a book compared to prior study of 5%. 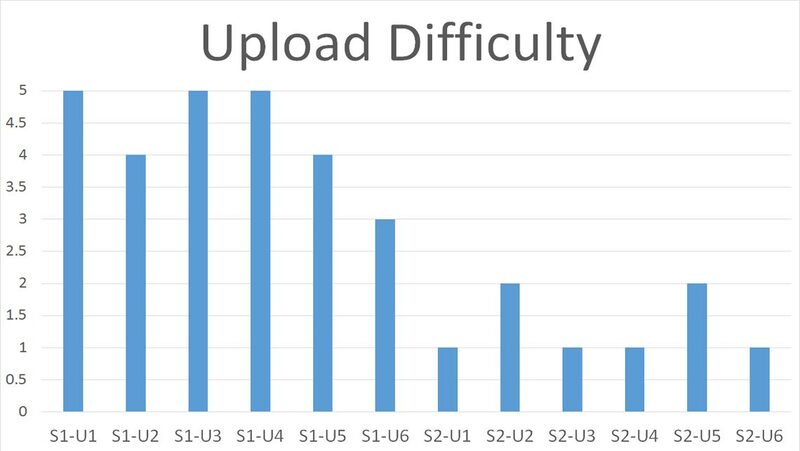 92% of the participants were able to convert a book to epub and upload it without the lengthy instructions.